Revo comes in two versions: free and paid. The free version performs basic uninstalls of 32 bit applications (even in 64 bit versions of Windows, though it may not be able to set a restore point prior to its work) while the paid version performs more exhaustive scans and fully supports 64 bit applications. A full feature comparison can be found on the download page. It's a quick and easy decision: if you're having trouble uninstalling something go grab the free version and give it a try. That's the free version of Revo on my Windows 7 64-bit machine, listing all the applications it's found, not unlike Control Panel's "Programs" section. Revo does more than a normal uninstall - not only does it run the uninstall program if it can, but after doing so will perform various levels of scans to remove the "left overs". The tradeoff here is simply time - the more advanced and through scans take more time. Naturally, you'll need to choose what to delete. In most cases, Revo starts by setting a restore point so that your registry is backed up should you choose inappropriately. A follow-up dialog asks you to also confirm additional files that Revo will delete for you as well - in this case your own good backup strategy will protect you from errorneously deleting something you shouldn't. In general, you should always start with the Control Panel's Programs (or Add/Remove Programs) section, or look for uninstall options in a submenu on the All Programs menu that installed software may have added. 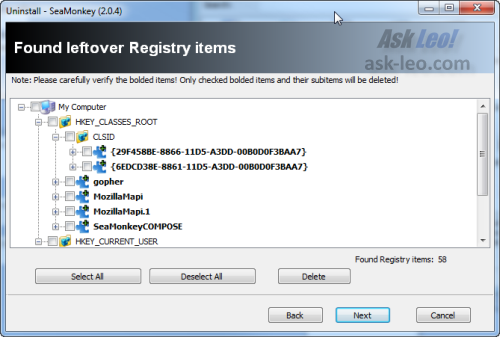 But not finding those, or having those fail ... or just wanting a more thorough cleanup than those might provide, Revo Uninstaller is a handy tool for the toolbox. Yep, that's kinda the point of the recommendation. Revo appears to be very good at exactly that. Give it a try. may i use this uninstaller on my xp windows? The 'Couldn't find the software' re the adobe uninstall post - I find that Revo cannot uninstall leftovers if the uninstall is first done with the program's own uninstaller and then one feels that there are leftovers. Going then to Revo,there is no icon there of the program left to click on. Is that what the poster meant also? I do LOVE Revo Unistaller. But, when you try to uninstall with the program's own uninstaller and things are left, sometimes Revo can't even help. I use Windows XP and use Revo all the time. As for trying to removed Abode, it is such a blotted program, that sometimes even using Revo first, doesn't get it all uninstalled. When nothing seems to get all of the program uninstalled, that is when I go to the Registry, look for the program and delete the whole thing. Yes, I know, messing with the Registry is NOT recommended, but sometimes that is the only thing to do, to get rid of 'pesky' programs. 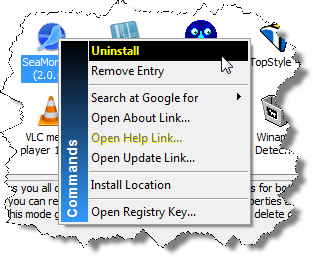 uninstalls just about anything and incorporates a lot of handy (for me) other features in one package. I did one information request to technical assistance and was pleased with the results, or maybe I should say amazed. If you're downloading from a proper/reputable site then nine times out of ten a corrupt download like that is due to anti-malware software on your machine being to invasive as it checks the download for malware. Temporarily turn it off and try downloading again. I love revo uninstaller it's by far the best tool. i been thinking about buying it. I'm having trouble getting rid of ZoneAlarm with Revo. There is no uninstall information, and using Hunter Mode (to drag & drop the taskbar icon) does nothing. 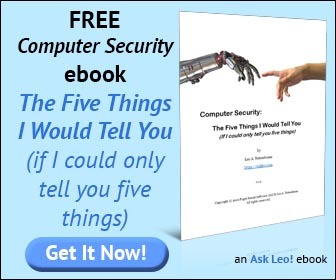 Having read this article, I can only put it down to it being a 64-bit program. Short of re-downloading, re-installing and uninstalling the (annoyingly still working) program, I am at a loss. 1. On Toshiba computers, it sometimes deleted Toshiba applications other than the specific ones I asked Revo to delete. I no longer use Revo to delete manufacturer-installed applications. 2. On a Windows 7 laptop, Revo did not list AVG. Per the AVG web site, I used the Control Panel to remove AVG. That did not work -- AVG was still installed and active even after "successful" uninstallation. So I used AppRemover (trying several methods within the AppRemove interface) to finally remove AVG. 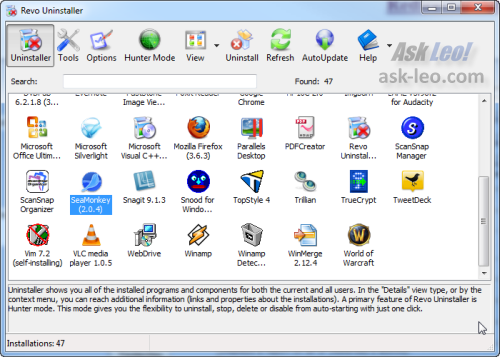 Though a long-time user and fan of Revo, a new uninstaller that might be well worth investigating is GeekUninstaller (which offers native 64-bit support). Originally released on 1 May 2012, it is still being refined, with the fifth version having been released on 2 July - http://www.geekuninstaller.com/ . I'm sure that I speak for many when I say that a review by Leo would be most welcome. I have used Revo Uninstaller free for four years on 32 bit machine and now paid on 64 bit machine for one year with no problems. I also had one program the would not uninstall in any way and got the paid vers. and used the forced uninstall. Worked like a charm. How do i use Revo Uninstaller to remove Strongvault Online Back up which comes on when i open one of my garage managing packages ?